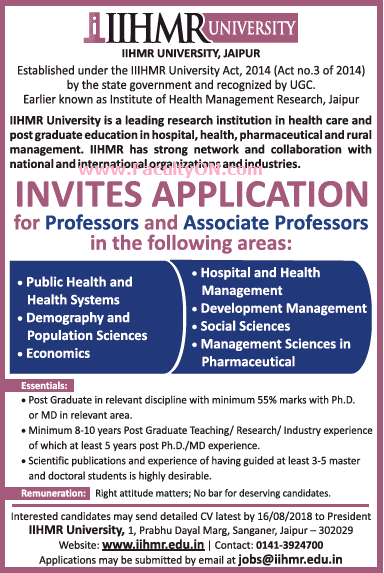 IIHMR University, Jaipur has advertised in THE TIMES OF INDIA newspaper for recruitment of Teaching Faculty - Professors and Associate Professor jobs vacancies. Interested and eligible job aspirants are requested to apply on or before 16th August 2018. Check out further more details below. About University: The Indian Institute of Health Management Research is an institute for Health and Hospital Management. Established in 1984 in Jaipur, IIHMR is the first of its kind in India, with attention focused on health systems research and management. PG with 55% marks with Ph.D or MD in relevant area. Should have minimum 5 years experience. No bar for deserving candidates. How to Apply: Interested and eligible candidates are requested to send CV, copies of certificates / testimonials, and recent PP size photos to the postal address or email address provided here.